27 years ago today, in 1987, the case of Nollan v. California Coastal Commission was argued before the Supreme Court of the United States. To paraphrase Tim Sandefur‘s thoughts on the matter: On the 200th anniversary of the Constitution of the United States – even with the aid of the Federalist Papers – the nation’s best lawyers, on the highest court in the land, still have no idea what the government exists to do. This is the state of things, folks. I stumbled onto this post a few days ago (honestly, I don’t remember where I first saw it) and marked it to read later. After finally getting around to reading it this morning, I felt like I had to share. 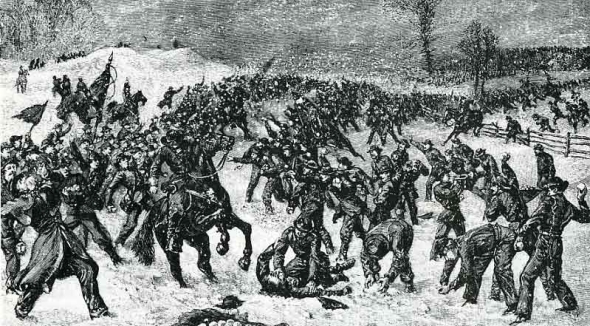 A Civil War Snowball Fight. The charge was sounded by our buglers, and the brigadiers and colonels gallantly led on their respective commands. When the contending columns met, the shock was terrible – the air was filled with whizzing snowballs, and above the confusion rung out on the clear cold air the shouts of the combatants. Here and there might be seen some unlucky hero placed hors du combat, with a red eye or a bloody nose. It must have been incredible to witness. You should most definitely go read the full article.